In my last posting I discussed the capabilities required to deliver an Airline Digital Transformation. The breadth of the capabilities that I recommended in the scope of the transformation covers many functional areas within the airline’s business. The capabilities span revenue management, airports, contact center and inflight, as well as B2C self-service channels, i.e. ecommerce. Most airlines I have interacted with or worked for typically organize the people that define and deliver the capabilities along functional boundaries. For example, an airline usually has one organization responsible for revenue management, another for airports, yet another for ecommerce, and so on. Most airlines rely on their IT organization to perform a high-wire balancing act that delivers the strategic needs of the business, , while simultaneously providing near-term value, i.e. quick wins. The IT organization cannot give up on delivering the strategic digital platform required for a successful Digital Transformation in order to deliver the quick wins. It must do both, and this is not an easy thing to accomplish. The challenges for the IT organization to be successful, and therefore for the overall Digital Transformation to be successful, are plentiful when the traditional airline organizational model is in place. Typically, the IT organization is often thought to be too slow, too expensive, and too bureaucratic, and also lack quality and innovation. The people within the non-IT functional areas of the enterprise end up feeling like they do not get the capabilities they need quick enough to impact the business goals that were agreed upon in the definition of the transformation. This can lead to discontent among the non-IT functional areas and usually causes them to look for other IT providers outside the enterprise to get what they need. Pressure to deliver more quickly from the non-IT functional areas causes the IT organization to start executing tactical moves, thereby hindering its ability to deliver a strategic digital platform. When this occurs, the entire Digital Transformation program comes under strain and in many cases collapses under the burden of the pressure. The airline spends potentially millions of dollars and sees little benefit. So, what should an airline do to prevent a failure of the Digital Transformation? Set up an agile organization, of course! I say this a little tongue in cheek, as one of the biggest buzz words in the technology space is ‘agile’. Everyone wants it but few know how to get it. Companies are spending a lot of dollars teaching their IT organizations to deliver using an agile methodology. But most don’t do the heavy lifting required to actually change the organizational model across both IT and non-IT to enable success. Agile delivery is not just an IT concept; it must extend to the non-IT organizations as well. You may notice that I called it agile delivery as opposed to agile development. I do this intentionally to highlight the need to consider all aspects of delivery of the Digital Transformation when thinking about doing it in an agile way. The organization must be set up for success for delivering capabilities that third parties will develop, that the airline will ‘build in-house’, and that are cloud-based and managed as a service, as well as capabilities that are hosted internally and managed internally. The complexity of the ecosystem of a digital platform is enormous. Simply saying the IT organization will deliver the Digitial Transformation using an agile methodology is naive. The entire platform lifecycle needs to be considered when designing an organization for a successful Digital Transformation. A typical way to think about the needs of a future-state organization model is that it must be designed for Plan-Build-Run. You must set up an organization that can do the planning and architecture, build or configure the capabilities, and then ultimately run it, i.e. use it for its intended purpose, in a ‘production’ environment. In order to establish a highly effective organization to deliver the Digital Transformation you must integrate teams across functional boundaries. This integration is required across IT as well as non-IT functions. Put together a team that breaks down the natural functional areas and co-locate as many of the people engaged in the transformation as possible. A structure that I have seen succeed involves designing ‘product’ teams for the solutions that contain the capabilities required for the Digital Transformation, and then building teams that span all aspects of delivery in one organizational entity. Also, group the products into teams as best you can to ensure that the subject matter experts on the business process and the technologies used to deliver the capabilities are working together as closely as possible. For example, a common capability included in a Digital Transformation is self-service check-in. This capability is usually delivered through multiple channels, i.e. mobile, traditional web, kiosk and airport agent solutions. Usually the channels used to deliver the self-service check-in are also used to deliver other business capabilities; for example, the web channel is also used for customer shopping as well as self-service check-in. What I think is effective is to define the ‘products’ that make up the digital platform, like web, mobile iOS, mobile Android, kiosk, airport agent, and so on, and put together full delivery teams for these products. These product teams include both IT and non-IT resources and are responsible for this product and the key metric associated with the success of the product, i.e. mobile check-in metrics. Also assign an owner to the business capability that spans the products. Make the owner of the business capability responsible for driving the consistency of the business process across the products, i.e. assign an owner to self-service check-in. This owner should make sure that there is consistent delivery of the capability across the products. All of these resources, if possible, should be in one organization, a Digital Transformation organization. By putting both IT and non-IT resources in one organizational team you break down barriers that usually slow down delivery and dilute accountability. Putting the teams together creates a ‘one team’ mentality and gets everyone working toward the common goals. Defining the products and getting the right resources in the product teams is critical in this model and is the key to success. The airlines should try and get as many resources as possible working together in the product teams to break down the bureaucratic processes that must exist if there are multiple organizations involved in the delivery of a product. Also, ensure that the capability owner is integrated into the agile delivery model that the product teams are executing. In summary, it is my recommendation that re-engineering the organization is mandatory to delivering a successful Digital Transformation. The executive leadership must buy into and own the agenda of the Digital Transformation and set up an organization built for success. Building ‘product’ teams consisting of both IT and non-IT resources is paramount to getting the speed-to-market and quality that the enterprise will need for the transformation to be successful. Ensure consistency of the business processes across the products by assigning an owner to each of the key capabilities that will need to span products. Lastly, ensure you have a rock-solid program structure in place that can integrate the plans across each of the product and capability owners into releases that will drive near-term value and also maintain the focus on delivering a durable strategic Digital Innovation Platform. 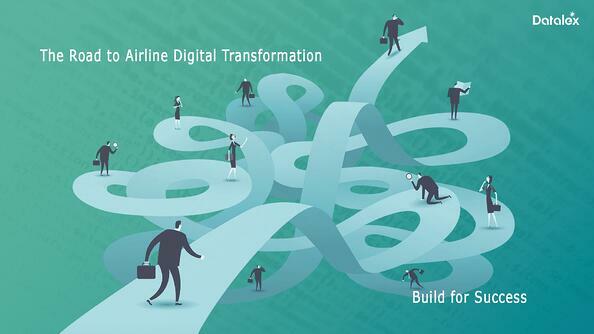 In my next blog post on this topic I will provide my recommendations on how to prioritize and sequence the delivery of the capabilities for a successful Airline Digital Transformation. I will propose a very high-level roadmap for delivering the capabilities. The roadmap will aim to provide early successes while maintaining the focus on delivering a strategic Digital Innovation Platform. Read post 5: "Prioritizing Capabilities and Governing the Airline Digital Transformation"